THE a la carte menu at Celestial Court has been given a revamp, with a focus on healthier ingredients and a contemporary approach, yet keeping its Chinese essence. The spread served at Sheraton Imperial Kuala Lumpur’s Chinese restaurant has been given a significant change, with only popular favourites retained as new dishes are introduced. Executive Chinese chef Ho Boon said having a change in the menu also provides Celestial Court’s regular diners with new tastes to look forward to. By combining new ideas and classic interpretations, the innovative chef offers creative courses for all to savour without forgetting the food’s honoured traditions. “While the menu has been revamped to cater towards a more health-conscious movement, we also make an effort to ensure that the dishes have great taste and flavour, as well as visual appeal,” said assistant Chinese chef Tommy Chong during an introduction of the new a la carte specials. The meal began with a hearty Clear Chicken Soup, Double-Boiled with Chinese Herbs and American Ginseng. The nutritious soup, which had been double-boiled for four hours, was served in a dainty tea-like set, complete with a tiny fire to keep the soup warm. 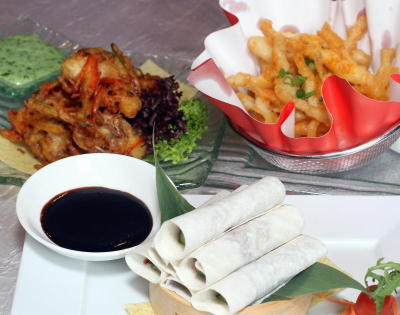 Signature appetisers: The (clockwise, from top left) Deep Fried Tempura Soft Shell Crab served with Wasabi Mayo Sauce, Deep Fried Silverfish served with Spicy Powder, and Peking Duck Rolls served with Plum Sauce are among popular favourites retained after the menu revamp. “This presentation — whereby the soup is poured cup by cup from the pot, and kept warm over a small fire — allows for better retention of heat, while allowing diners to enjoy the goodness of the soup,” said Chong. The Pan Fried Lamb Cutlet served with Honey Bean Shredded Onion and Rosemary Herbs features a fusion approach, with this traditionally Western dish taking on a Chinese influence with its sweet and sour sauce. “The cutlet, using grass-fed lamb, is served with a sauce made from Lea & Perrins Worcestershire sauce and tomatoes to give it a tangy, sweet, sour flavour,” said Chong. Next was the Signature Black Cod served with Rice Broth, Wolfberries and Spinach. “Instead of the usual light soya sauce, the cod is served with a rice broth that has a very mild flavour to allow the essence of the fish to be retained,” said Chong. The Crispy King Prawn served with Cornflakes, Shredded Egg in Butter Flavour would appeal to fans of this particular seafood. Catch of the day: Crispy King Prawn served with cornflakes, shredded egg in butter flavour. 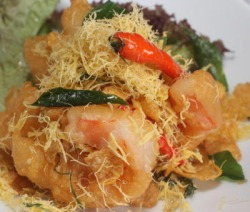 “The corn flakes, which are also finely ground for the prawn coating, gives the king prawn a more crispy bite,” said Chong. Diners who must have rice as their staple may opt for the Celestial Court Special Fried Rice, served with Glutinous Rice, Brown Rice and Barley. “This pot of rice has a combination of high-fibre ingredients like barley, sunflower seed and malt that are fried with scallops, barbecued chicken and mushrooms, and topped with Bonito flakes,” said Chong. Also served during the meal were some of Celestial Court’s signature appetisers that are among the restaurant’s popular favourites, namely the Deep Fried Tempura Soft Shell Crab served with Wasabi Mayo Sauce, Deep Fried Silverfish served with Spicy Powder, and Peking Duck Rolls served with Plum Sauce. 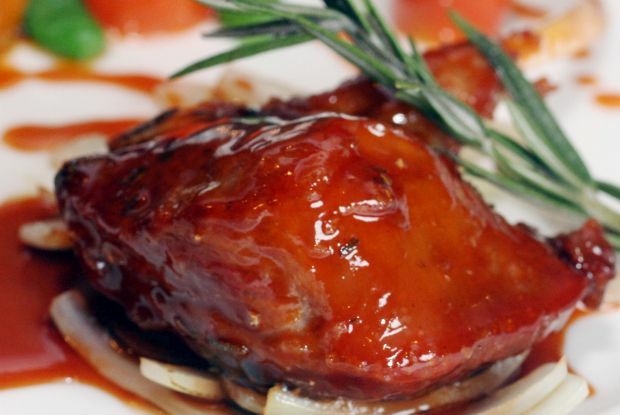 Celestial Court’s new a la carte menu is available now. Prices start from RM30++ per dish. Diners who present the original published version of this article will receive a complimentary bottle of wine from the restaurant’s house selection (or juices for Muslim diners). To be entitled for the promotion, there must be a minimum group of four diners and the order must include at least one new a la carte dish as featured above. The promotion period is one month from the date of publication.